Warm welcome! I would like to inform you that renovations still take place on the 3rd and 4th floor. Also, with our front office staff we implement Welcome Project so we can provide you with better service. For all drawbacks, please accept our apologies. 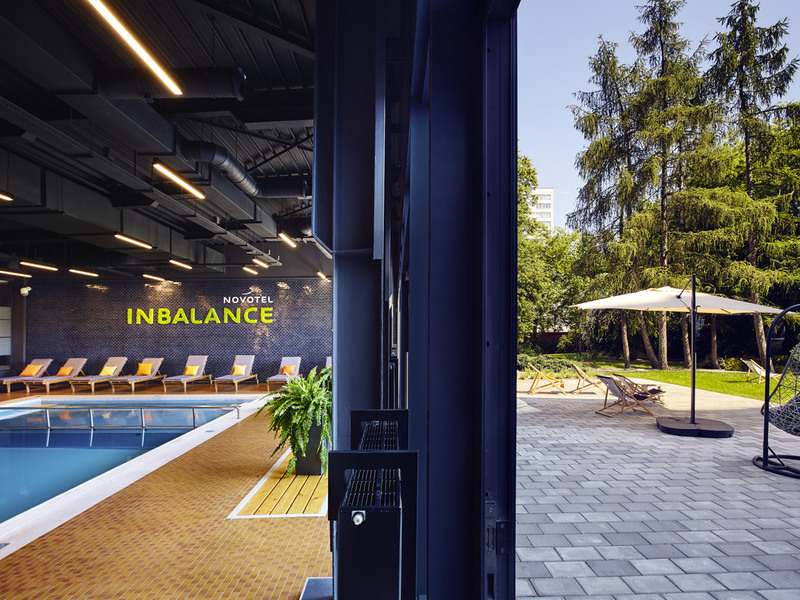 The 4-star Novotel Krakow City West will surprise you with its modern interiors, a renovated fitness centre, a swimming pool and a colorful children's zone. Spacious 30-metre rooms, warm colors, super-fast Wi-Fi guarantee a comfortable stay and ideal environment for work. At Novotel we care about your well-being, so the time spent in Novo2 Louge bar and live music will be the perfect ending of the day. Our location is ideal for families and for those who love sport. 10 minute run is a distance from Krakow's largest park - Blonia. Kosciuszko Mount is located just "around the corner". For families; swimming pool, fitness, indoor playground and spacious Swimming pool, fitness, play corner, spacious rooms. Public transport stops are right next to the hotel. Convenient access to the ring road or Balice airport. And soon Kraków Bronowice railway station. The hotel is located within walking distance of the city center. Scintillate your tastebuds with a cup of aromatic coffee or a refreshing cocktail in our bar. Exelent welcome and dragons room was excellent! Lovely stay our 6 years old daughter loved it. I have stayed at this hotel a number of times and I am inclined to say that this is the best Accor Hotel in the entire city. While it is located about 3 kilometers from the city center, the local transportation is great and the distance is also certainly walkable. The staff are extremely helpful, most of the rooms have been renovated, and the food id great. This is evident during breakfasts where you get the variety and the hospitality that is difficult to come by in the other Accor locations in Cracow. I truly recommend this location highly. Our second stay within one month and five stays here overall. So our favourite hotel in Krakow! Staff were all super friendly as was expected. Breakfast was sufficient and to the usual standard. The only issue on this occasion was the shower and we have noticed that all Accor properties are using the plastic hose. There was a lack of pressure and the water was not draining, causing the bathroom to flood every shower. Unsuitable room for my needs. Unfriendly staff. I received a room for people with disabilities. I could not use the mirror in the bathroom since it is mounted too low, also there was no proper furniture to place my items on. The staff did not take the time upon check in to inform me about breakfast time, usable facilities in the hotel etc. The hotel is great but during my stay a lot of people were really noisy. The breakfast room was crowded and it was difficult to get a coffee. Novotel West was a wonderful property as usual. The team is wonderful and the warmth of the hospitality was fantastic. The room was large and the beds were amazingly comfortable. We had an enjoyable stay at the hotel in mid March. Renovation work at hotel and nearby construction work did not impact on our stay at all. Good regular public transport available from just outside the hotel to the centre of the city. All staff were extremely helpful and courteous at all times. Very quick and efficient check in. Spacious and comfortable room. Fabulous city. Hotel provides good value for money and it is easy to take taxi to city centre or bus. Staff at hotel are very friendly and particularly in the bar you are made to feel most welcome. Swimming pool and gym are good facilities. Only doen side is the ongoing building works which start at 07.30. This was a comfortable hotel stay just outside the Krakow city center. We enjoyed our stay at the Novotel Krakow City West. Although we *did* have to ask three times not to be talked into other ways to earn Accor hotel points upon check in (we had been traveling and awake for 26 hours!) -- which was a bit annoying -- all of the personnel and staff we met during our stay were very nice and helpful. What we were impressed with most that even though it was clear that there were several large travel groups staying at the hotel, the noise was never a problem, and while in our room, it seemed like we were the only persons staying in the hotel. Nice and kind staff, clean and well equipped room with good free WiFi connection. I recommend without hesitation. Very comfortable hotel. The only issue with my stay was that the hotel room was too hot and the air conditioning wasn't cooling the room. Everything was great, the hotel made it possible for us to have an early check in, the pool facilites perfect, the breakfast tasty and nothing to want more.